The Olympics is an amazing time. It's a time when athletes who spend most of the season as rivals come together for their country, set egos aside and unite as one team. 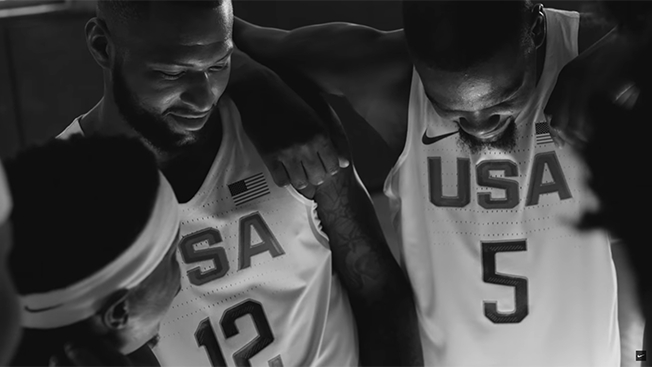 In order to unite the U.S. men's and women's Olympic basketball teams in their quest for gold, Nike came up with a new kind of national anthem to rally them. And it had help from a rising star in the music industry. Chance the Rapper stars alongside some of basketball's biggest stars including Kyrie Irving, Draymond Green and Elena Delle Donne in Nike's latest ad from Wieden + Kennedy New York, "Unlimited Together." Not only does the rapper star in the spot, he also wrote original lyrics for "We The People," the song that's featured in the Hiro Murai-directed ad. Inspired by The Star-Spangled Banner, Chance the Rapper's song focuses not only on uniting the two teams competing in Rio, but also rallying support back home. "People, people. We, the people, would like you to know, wherever you go, we're right by your side," the rapper sings. Both teams, the spot argues, will be stronger as a unit, and their success depends on the entire team—not just one superstar. The film feels a bit more like a music video than an ad, cutting from shots of the rapper to images of the players from both squads projected onto buildings. It's mesmerizing, though. The decision to shoot the spot in black and white lends it a more gritty yet inspiring feel. "Unlimited Together" is another chapter in Nike's "Unlimited" campaign, which includes "Unlimited Courage" starring Chris Mosier, the first transgender athlete to make it onto a U.S. national team, and "Unlimited Future," an ode to athletes as babies. If you can't get Chance the Rapper's new track, "We The People," out of your head, you can listen to it on iTunes and SoundCloud beginning Aug. 11.